So now I've had the Helix for 3 weeks, and I work with it for hours every day. I really like the user interface (UI); no question. If I were a gigging musician, this would be much better than hauling around a pedal board and the associated cables. Now that I've gotten to know the ins-and-outs, it's pretty easy for me to dial in a sound that I want. I've set up a "Favorites" list that allows 128 presets, and I've organized them under: 1) Drone settings, 2) Big Ambient Swells, 3) Clean guitar arpeggios and Lead Guitar settings, etc. I did buy some presets from Glenn DeLaune, (a big name in this business), and loaded them up. The primary benefit of that, in hindsight, was to see how Glenn thinks when setting up his presets. Like: where does he put the amp and cab in relation to delays? What delay does he feed into what delay? What kind of distortion does he use? It was helpful to see his way of setting up sounds. Then I went through all the "Ambient Presets" on the Line 6 Customtone website. This is a site that lets Helix users upload/download their personal favorites to share among the community. Frankly, most of this was not interesting, but I did download about 15 presets that I liked and can use. Again, mostly to just see what others are doing in designing their signal chain. One comment on that: I found that most guys/gals stack up too many, (IMO), pedals in their chain, e.g. : two amps, two or three delays, two or three reverbs, a chorus, a pitch-shift, etc..... It's just so easy to go crazy. What happens is that the output sound gets thinner and thinner the more pedals you go through. At first, I thought it was an inherent "thin-ness" to the Helix; but no, if you have a chorus, a tape delay, into a hall reverb, you can get a really clear, bell-like, deep, clean, sustaining chord swell. Don't be fooled by a complex signal chain. 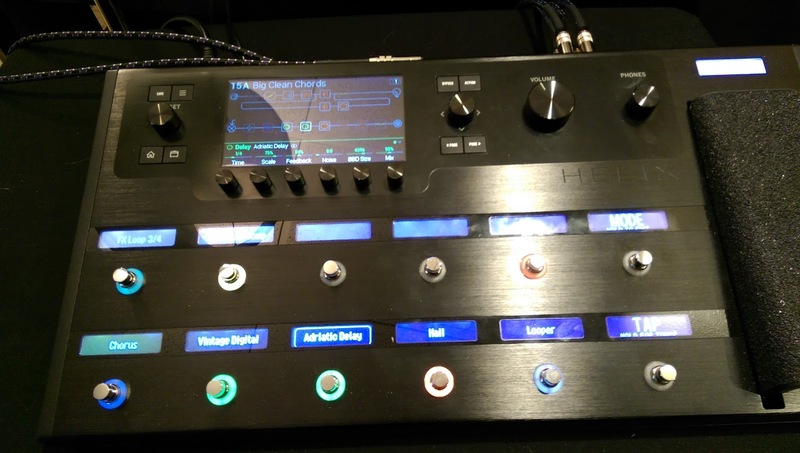 Get an amp/cab sound that you like, sensibly stack the signal chain, and the Helix is sweet. So now, after maybe 40 hours of studio/playing time with the Helix, I think I've totally got my arms around this device. I can make the changes I want really quickly. I use the HX Edit software on my PC (via USB) to create the sounds I want, and it's extremely friendly and effective. 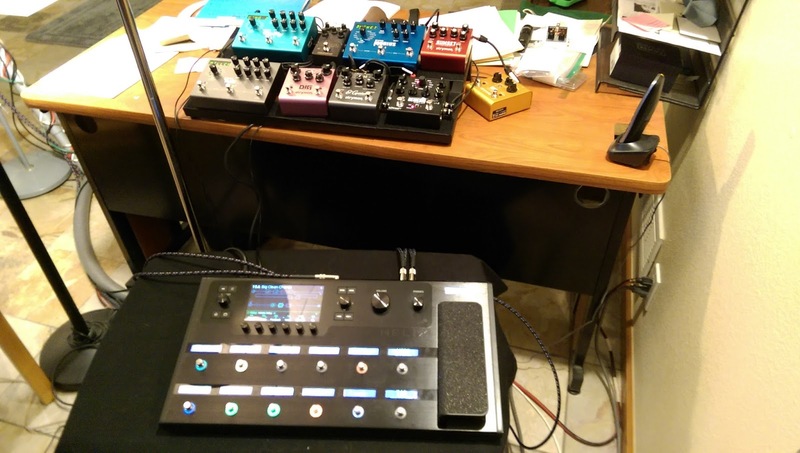 For example, if I want to record a drone, or some chord change swells, I record them on my looper, set it to playback, and then go the computer and mix-and-match my effects: dial in the best sounding feedback and mix for the delays, try a few different distortion effects, switch from plate to hall reverb, stack two reverbs, try a reverb in front of the delay, etc. on and on. The beauty is, then I can hit "save", give it a name, and I've got it for tomorrow. It's really easy and powerful. I've created a piece using only the Helix, and frankly, I think it sounds quite good; especially the drones, because as I've mentioned before, the dirt/distortion/rock/grunge/metal sounds are pretty prominent on the Helix. The issue that I go to bed thinking about, and wake up thinking about is the "quality" of the effects. For the distortion, EQ, modulation, etc, I'm OK with what the Helix provides; it's good, some are great, but all-in, it's very good stuff there. It's the Delays/Reverbs that bother me. What I've really learned in this process is that I am a "sound freak". Didn't think I was. Regarding Delay/Reverbs: Sometimes the Helix has that "organ-y", "metallic-y", "hollow-y" sound on the delays and reverbs. But I can only hear that clearly on direct A/B comparisons to my Strymons; eyes closed, clicking between track one (Helix) and track 2 (Strymons) playing the same loop.) My Strymon Timeline/Bigsky pedals are just, well, magnificent. They just plain sound great; I can listen to their clarity, their depth, their lush-ness, their integrity...heck, I can't describe it in words, but I absolutely love their sound. I can listen to a loop of swelled chords through any of 8 of the Timeline engines and 5 of the Bigsky engines and am totally satisfied. Smiling even. The Helix is close; nearby; somewhat the same; in the general vicinity. But NOT AS PHENOMENAL. That's it! That's the whole story. That's the decision to be made. Some would say, "Well then, run the Timeline and Bigsky through the effects chain and get the best of both worlds!" Yeah, I tried that. It's easy, the UI totally supports it, it's stereo, very slick. But, I still don't like the idea of hanging a couple of pedals off the Helix. When will that end? Why not hang the Mobius off there, too? 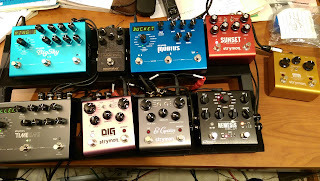 And then how bout the nice Sunset Overdrive, or my beloved Strymon Dig? Heck, I can strap the whole pedalboard on there! And lastly: I just love pedals! 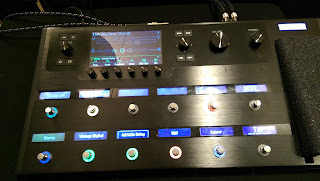 I saw Chords Of Orion demonstrate the new Neunaber Inspire Chorus and thought, "oh, yeah, I gotta get that pedal!" I guess if I go Helix, I'm locked in to the "no new pedals" mantra for a while. Bummer there. I'm gonna do some more A/B testing with the pedalboard vs the Helix. I'll be back.